Controlling soft synths with keyboards can be a pain, only because it often requires messing around with templates or MIDI learn to map hardware knobs and faders to onscreen controls. Propellerhead’s Remote is a fantastic two-way protocol that allows your keyboard to automatically control synths — but it only works in Reason. What about the rest of your software? The folks at Novation have a brilliant new keyboard, the ReMOTE SL, that takes that idea to the rest of the soft synth world. 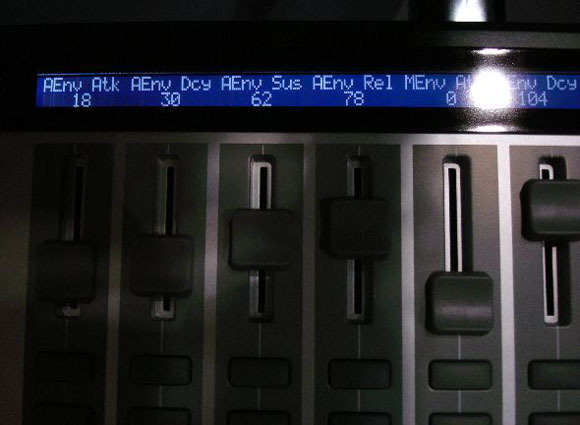 Via their Automap technology, the keyboard can configure itself for whatever synth you’re using, displaying each parameter on a beautiful LCD display above its knobs and faders . . .
Automap doesn’t just worth with a couple of synths: it works with every VST plugin in Cubase. Fire up a plug, and it automatically maps plugin parameters. Brilliant. So far, Automap only works with Cubase and Reason, but Novation is promising more; the keyboard isn’t due until around February. They showed Logic Pro at AES successfully, and it sounds like Ableton Live should follow soon, as well. (Novation’s included templates and editor software are both great, too; those remain on the SL.) Like previous ReMOTE and X-Station keyboards, you won’t be limited to the 25-key model, either; that should be followed with 37-key, 49-key, and 61-key versions. The LCD screen, as you can see, is absolutely gorgeous. It’s incredibly clear and easy to read. I’m a fan of Korg’s Kontrol 49, but the Novations have an edge here: nicer LCDs, more controls, aftertouch (there’s no aftertouch on the Kontrol 49), and nice, big X/Y touchpad and pitch/mod joystick controllers. For those still debating whether continuous encoder knobs or rotary knobs are better, the SL has a row of each. 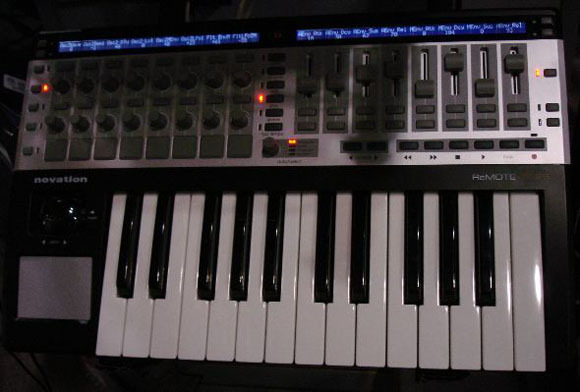 Bottom line: Novation is the control surface / keyboard to beat. 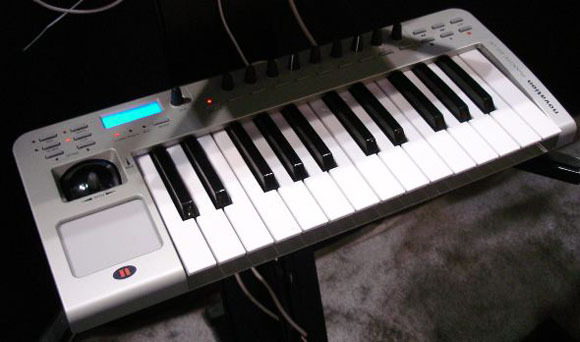 The other thing worth mentioning about Novation’s keyboards is how fantastic the keybed feels. Amazingly, even their new “bargain” keyboard, while it reduces the number of available knobs and faders and eliminates channel aftertouch, has the same action. Pictured below . . . it’s even smaller than it looks here; it could be a good choice for squeezing on top of an existing keyboard for controlling clips or cues or keeping by your computer for synth programming.